This commission came from a composer who works in microtones. 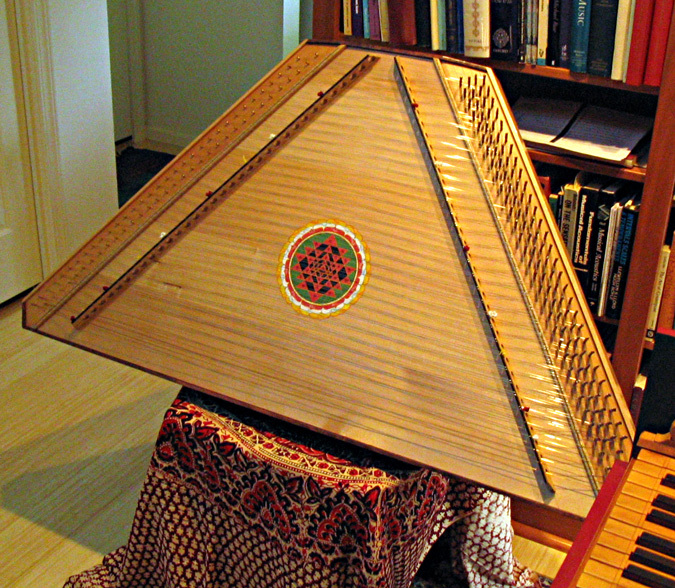 He designed this instrument which was built by Owen Daly and he approached me about decorating it with the "Sri Yantra" mandala. I did a little research and learned which pigments were available to traditional Tibetan Thangka painters, and used only those in painting the mandala. The blue/black color is indigo, the coral-red color is genuine vermilion and the white is made from ground oyster shells. The yellow is a unique pigment from Cambodia called "Gamboge."